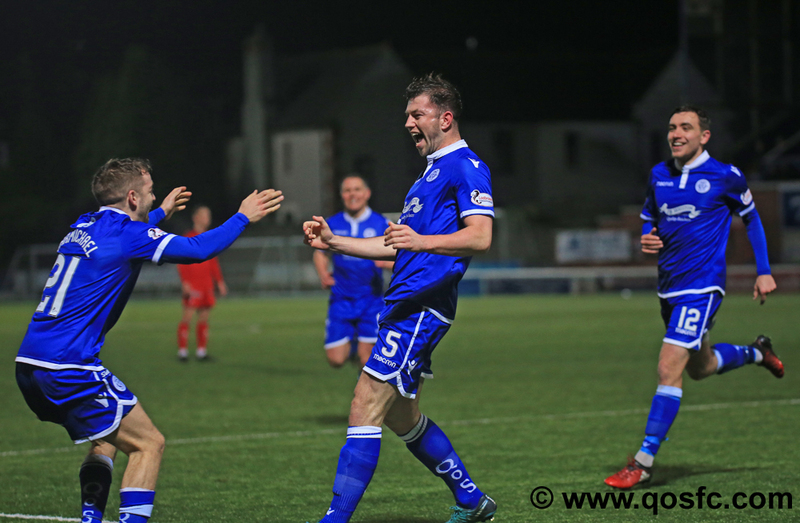 A spirited second half performance almost brought Queens the result they needed after a very indifferent first 45, but with only three minutes of the game remaining, visitors Falkirk equalised to leave us with a mountain to climb if we are to contest the end of season play-offs. 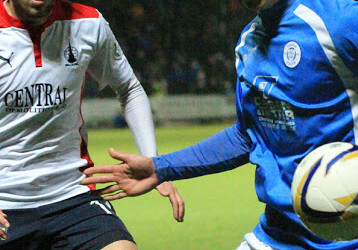 The last of a run of five games in a fortnight saw Queens make two changes to the team that were beaten at Dunfermline last time out, with Kyle Cameron replacing Scott Mercer in defence, and Derek Lyle starting in place of the suspended Lyndon Dykes leading the attack as Queens went with a 4-2-3-1 formation. Once again we were without leading scorer, Stephen Dobbie, still sidelined through injury. The game was barely five minutes old when Queens achilles heel struck as a defensive error let the visitors in. Kyle Cameron mis-controlled the ball 10-yards outside the box to present the ball to Nelson who placed a low shot past the diving Jack Leighfield. 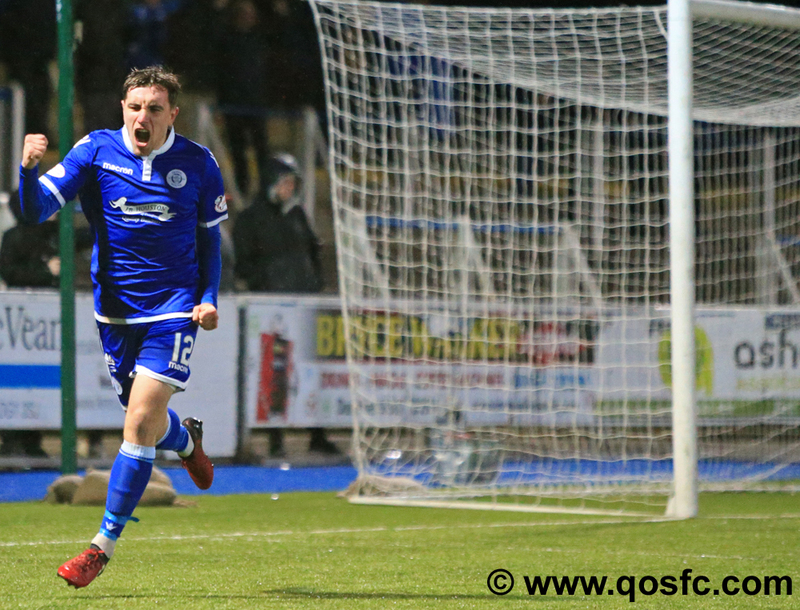 It was just the start that Queens didn`t want, and the first quarter of the game was largely controlled by the away side with Queens struggling to get any quality service up to lone striker Lyle. The biggest cheer from the home support in the alarmingly low crowd of just 1062 came when the lively Jakubiak was booked for simulation after 24 minutes, and it was the visitors who almost went further ahead moments later when Sibbald almost got on the end of Nelson`s inviting cross. With 15 minutes of the half left, Queens suddenly found some rhythm and went close to finding an equaliser on two occasions. Firstly a half volley from Lyle was only just too high from 8-yards out, and then Joe Thomson flashed a diving header wide of the far post after good work down the right from Lyle. This was certainly Queens best spell of the half and Dom Thomas nearly drew the home side level after cutting across goal from the right and powering a low drive inches wide of the far upright. The half drew to a close with Queens on top, and Thomson`s excellent ball picked out the run of Lyle, but instead of shooting first time he elected to try and cut back inside but Falkirk defender Grant read the situation well and was able to cut out the danger. 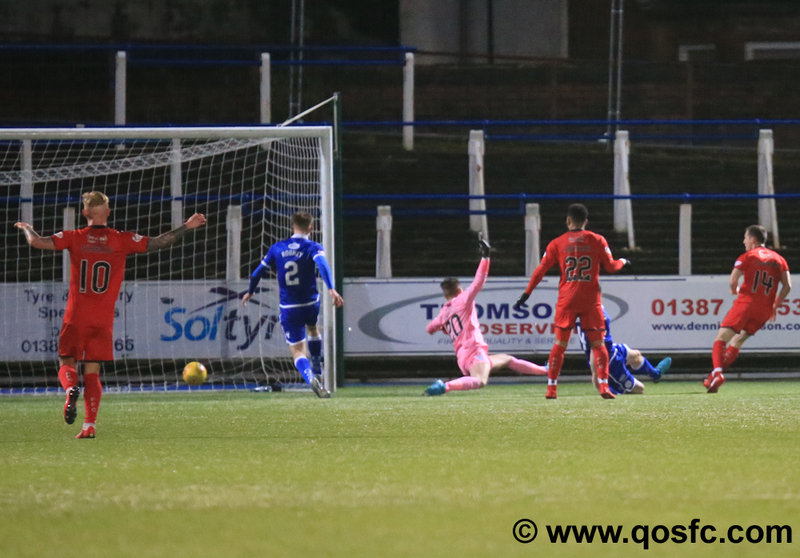 Queens` first corner of the game arrived right on half-time, but the long wait for such a set-piece was a let down as the delivery into the box was headed clear at the front post and it was the visitors who held a slight advantage at the break. There was a marked improvement to the way Queens began the second half, as their tempo quickened and prompted by the play of both Kyle Jacobs, and Joe Thomson, they offered more support to Lyle and at last Queens started to look more of a threat in the forward areas of the pitch. Their bright start to the half brought a quick result when on 51 minutes they drew level. After winning a corner Dom Thomas` delivery was headed out towards the penalty spot, and Joe Thomson did extremely well to keep control of his shot and smash the ball through a group of players and into the net. Clearly dominating the proceedings at this point, Queens looked to push home their advantage and Thomas saw his low drive comfortably saved at the foot of the near post. That was to be his last action of the night as he was replaced by Dan Carmichael just past the hour mark. A foul in midfield by Kyle Jacobs led to him being cautioned by referee Kirkland, and from the resulting free-kick a header from McGhee flew just wide of the Queens goal. 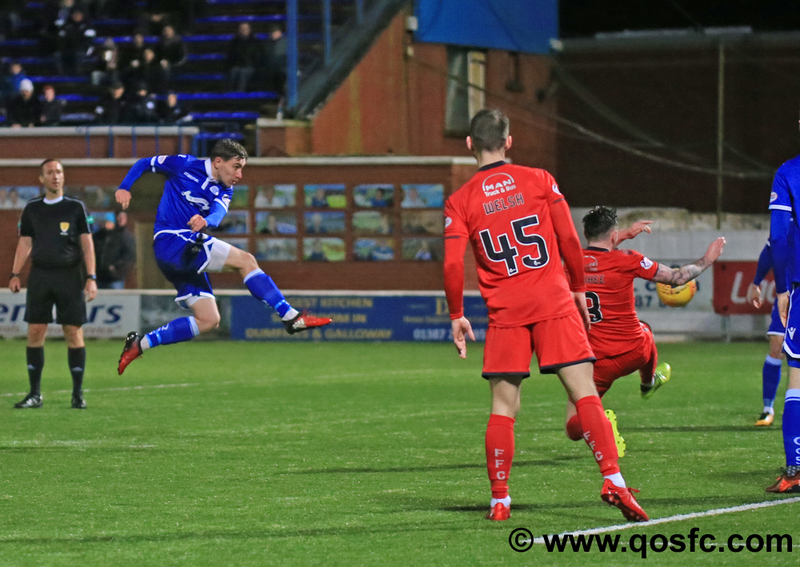 Our second change saw Shaun Rooney replace Kyle Cameron with Callum Fordyce reverting to his more familiar centre-back role, and just two minutes later, Queens had turned the game round as they got the benefit of some sloppy defending as Sibbald conceded a needless corner. From Carmichaels` pin-point delivery,Darren Brownlie rose unchallenged at the near post to power a header beyond `keeper Hazzard. 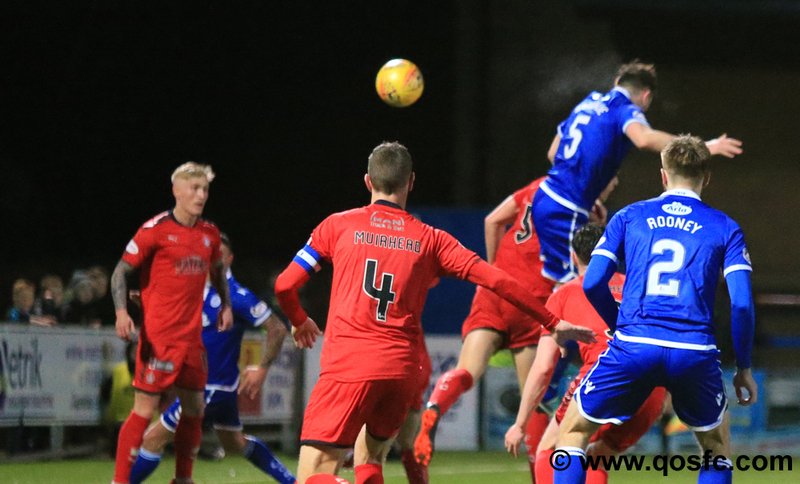 The goal was the centre-back`s first since he scored against the same opponents back in October and with 17 minutes to go, Queens held the upper hand. A flurry of substitutions saw Falkirk make two, and Queens replace Lyle with NikolayTodorov for the final 10 minutes, and all three substitutes would go on to be involved in the latter stages, some with more meaningful significance. A break down the right by Thomson should have ended with Queens celebrating another goal, but from an almost impossible angle and with Todorov well placed for a simple tap-in, Thomson elected to shoot and his luck was out as his effort slid wide of the far post. With the game just 3 minutes from it`s conclusion, and with Queens looking like grabbing their first home win for 3 months, the cruelty of football reared it`s ugly head as the visitors grabbed a share of the points. A foul by Shaun Rooney on the left saw the ball eventually worked out to the right wing where substitutes Harris and Longridge combined well, and when Harris slipped a pass inside to Longridge inside the Queens 6-yard area, his deft flick with the outside of his boot flew past Leighfield to tie the game up. There was hardly anytime for the game to re-start, and with news filtering through of another win for Dunfermline, the stark reality was beginning to sink in that although nothing is certain, it is now going to take something quite remarkable for Queens to compete in the end of season play-offs.Kyle Jacobs was named as sponsors man-of-the-match, and Queens will no doubt be frustrated at not being able to hold on to the advantage that they had worked so hard to establish. 19:29 Correction, Mercer is on the bench.